Thunderbird 60 was released about two months ago, with version 60.2.1 being the latest, but Ubuntu 18.04 / Linux Mint 19 and older continue to offer version 52. Here is how to install the latest Thunderbird 60 in Ubuntu or Linux Mint. 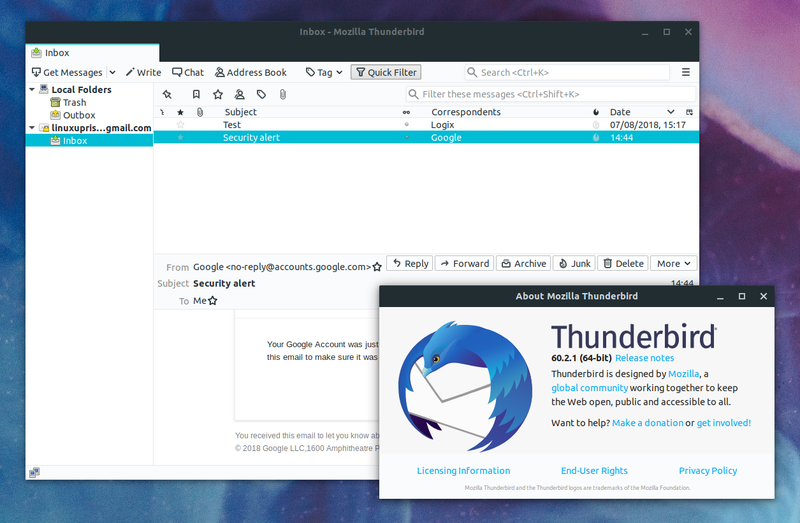 Mozilla Thunderbird is a free and open source email, news, RSS and chat client for Linux, Windows and macOS. The latest Thunderbird 60 stable includes important changes, like a new "Photon" look, new light and dark themes, and attachment management and calendar improvements, among others. To install Thunderbird 60 in Ubuntu or Linux Mint, you can use the Firefox ESR and Thunderbird stable builds PPA. You'll also receive future Thunderbirds updates by adding the PPA. The PPA is available for Ubuntu 18.04, 16.04 and 14.04 / Linux Mint 19.x, 18.x and 17.x. Ubuntu 18.10 Cosmic Cuttlefish already has this version so there's no need to add the PPA. Thunderbird is also available on Flathub, but it's still version 52. The Thunderbird Flathub package was updated to version 60 at some point, but it was reverted back to version 52.9.1 due to a bug causing the application to crash on startup. This bug appears to only affect the Flatpak package though, as I didn't stumble upon any issues with the Ubuntu PPA package.